This center is hosting events for 100+ people. Members enjoy secure super-fast internet, a high speed business class copier/scanner/printer, free coffee, tea, filtered water and weekly catered breakfast. This center takes care of office operations so you can focus on networking and growing your business. This location is within walking distance from the Brightline express making for convenient access. First class business centre in the centre of West Palm Beach. State of the art technology and friendly staff. Within minutes’ of I-95 and high end shops and dining. Attractive business centre offering flexible office space with many services to choose from in a luxury setting. Small offices to large and multiple office suites and virtual offices. 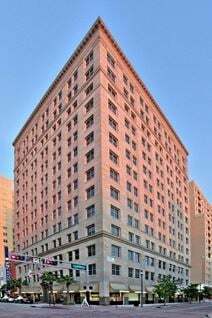 Conveniently located in the heart of downtown West Palm Beach with easy access to various entertainment facilities. This stunning serviced office provides a range of high-quality suites with great views in a charming building. This address is easy to access and is close to banks, restaurants, shops and other local amenities. 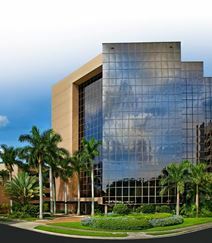 Suites are available from 1,000 to 19,000 square feet on traditional lease terms, minutes from I-95, the Convention Center and Palm Beach International Airport, and within walking distance from CityPlace and Palm Beach county courthouses. The local transport links in the region are also excellent, with convenient services operating frequently and making this center easily accessible from anywhere in the area. Luxurious office building in Downtown West Palm Beach boasting an array of services to help your business succeed. State of the art technology, covered parking, conference rooms and beautiful lobby. Offices with beautiful views of Palm Beach Island and downtown. Convenient access to shops, dining and civic centres. Conveniently situated across the street from the popular and locally renowned Palm Beach Yacht Club, this high quality premium business center offers stunning views of the ocean and a recently renovated four-storey atrium, in addition to some of the most technologically advanced and innovative state of the art corporate facilities anywhere in the region. A full range of corporate services and amenities is available to all tenants. This brand new center offers a multitude of different offices to suite any businesses needs. Located in the great area of West Palm Beach, this location offers multiple amenities that are sure to impress. Local golf courses surround this office, providing many opportunities to host company parties or networking events. With this centers windows facing the outdoor landscaping, it provides a beautiful view for employees and guests alike. This Class A corporate building and working environment building is only a few minutes from Downtown West Palm Beach and puts an emphasis on taking stress out of the workplace with zen inspired décor, daily nutritional meal deliveries and yoga and massage therapist sessions. The offices and meeting rooms have wonderful views from their 12th floor location. Class "A" Building, located only a few minutes from I-95. This hurricane resistant, weather-proof office building provides safe and high quality flexible office space. Tenants of the building include Humana, Royal Bank of Canada and Oasis Outsourcing, all of whom benefit from being just a couple of miles from Palm Beach International Airport. The area offers convenient and frequent transport connections, with regular road and rail services operating throughout the locality and making the center easily accessible for all.